New 15-story office building will incorporate salvaged 1912 limestone façade, which is being supported by an intricate steel framework throughout construction. 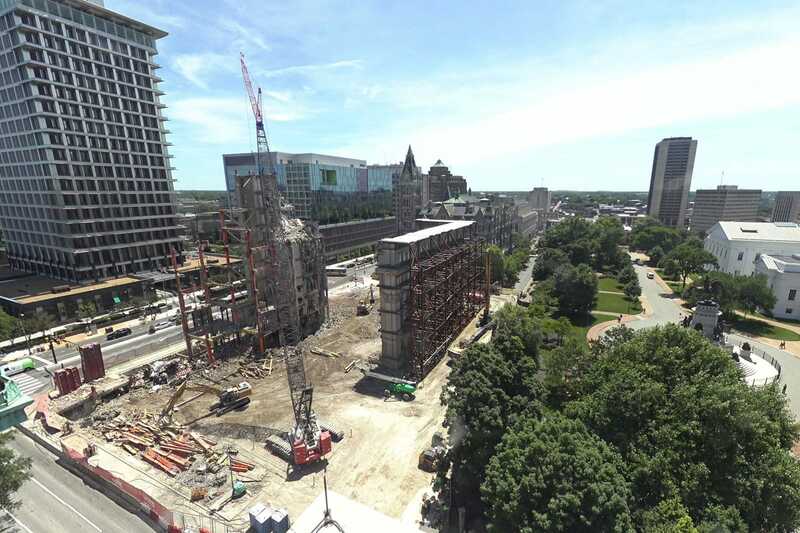 A new General Assembly Office Building (GAB) will be built for the Virginia state legislature, replacing the 420,000 square feet of existing buildings on the corner of Ninth and Broad Streets in downtown Richmond, VA. Before construction began on the new building, the existing buildings underwent hazardous material abatement and demolition. Gilbane was also tasked with several supporting and phased renovations to provide adequate swing space for the General Assembly. Renovations to the Monroe Building, Main Street Center and the Pocahontas building occurred concurrently while portions of the buildings remained occupied. The fast-tracked renovations started in 2016 and were complete before the official groundbreaking of the General Assembly building in August 2017. 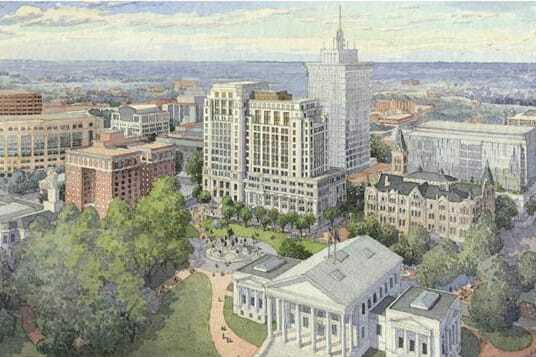 The new building’s design will reflect the historic nature of its surroundings in Capital Square, incorporating surrounding architectural elements. 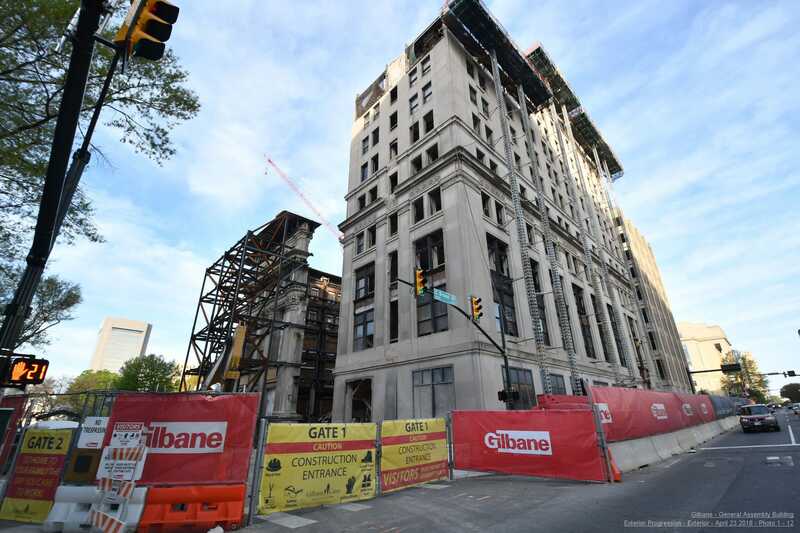 To accomplish this, Gilbane is preserving the historic façade throughout construction, and will incorporate it into the new, but classic design. The original six-story 1912 building was built with an elaborate exterior limestone façade that features three-story Corinthian-style pilasters. In October 2017, the team began constructing a temporary steel bracing tower to support the soon freestanding façade. This effort involved the erection of nearly 370 tons of steel columns, beams, outriggers and whalers; as well as the drilling and pouring of three-foot diameter concrete caissons approximately 60 feet below the site. Seismographs to monitor vibrations and anchored survey points were installed to the façade during demolition to ensure the limestone façade did not move during this process. By the end of March 2018, the 105-year-old façade had been cut away and was standing on its own for the first time, protected by an intricate framework of steel. The new General Assembly Building is currently under construction. It is projected to be complete by 2021. The lower four floors of the 400,000-square-foot building will include various public functions, including committee rooms, a cafeteria and other meeting facilities. Above the fourth floor will be legislator and staff offices and other meeting spaces. The design features a stepped exterior to resemble other traditional architecture found in Richmond.